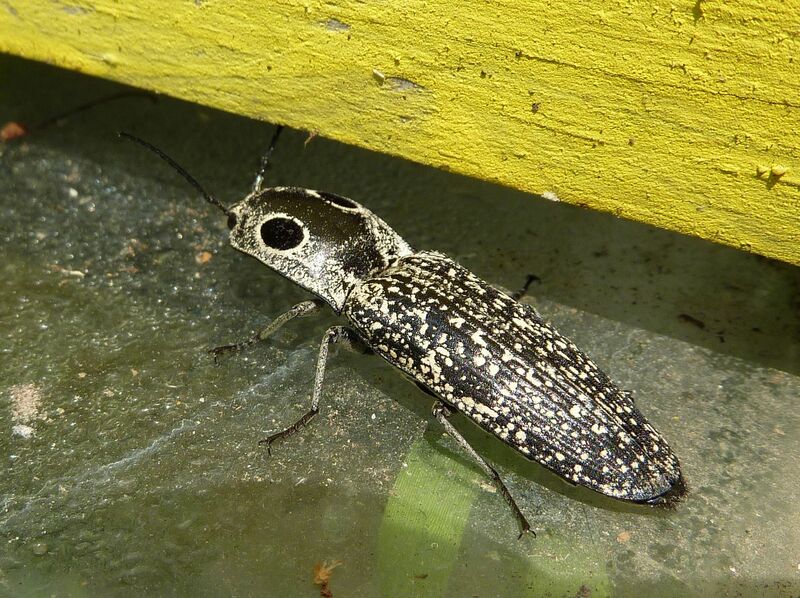 Eyed Click Beetle, This was 2 inches long if not a little smaller. While preparing one of my empty hive boxes to be a swarm catcher this wonderful critter flew right at me. It's an Eyed Click Beetle, Alaus oculatus. I found one of these last year at Crows Woods, and assumed it was one of those semi-exotic insects you can only find in ideal conditions. From what I've read, this insect is a beneficial. Adults feed on nectar and plant liquids. It's hard imagining this thing sticking it's head inside a flower, and I don't see any images on Bug Guide to suggest this either, so I assume they mostly go for tree sap. The grubs are predatory of other wood boring beetle grubs so also beneficial.